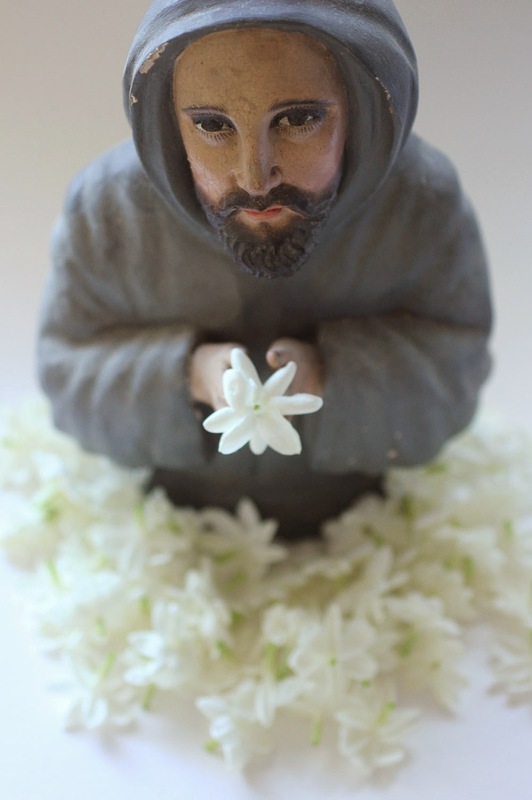 The daily gathering of little white florets from for the Jasmine sambac tincture continues. Although there was a bit of a dry spell of blossoms for about a week, the plants are flowering once more. These waxy, abundantly scented little flowers have been getting added to 190 proof grape alcohol since April of this year. Thursday morning, while filtering the tincture, I poured a tablespoon into a glass. After finishing the process and cleaning up, I studied the fragrant potion and drank. The first impression was the strong, sharp, astringent taste of the 190 proof organic alcohol followed by the most glorious floral flavor. 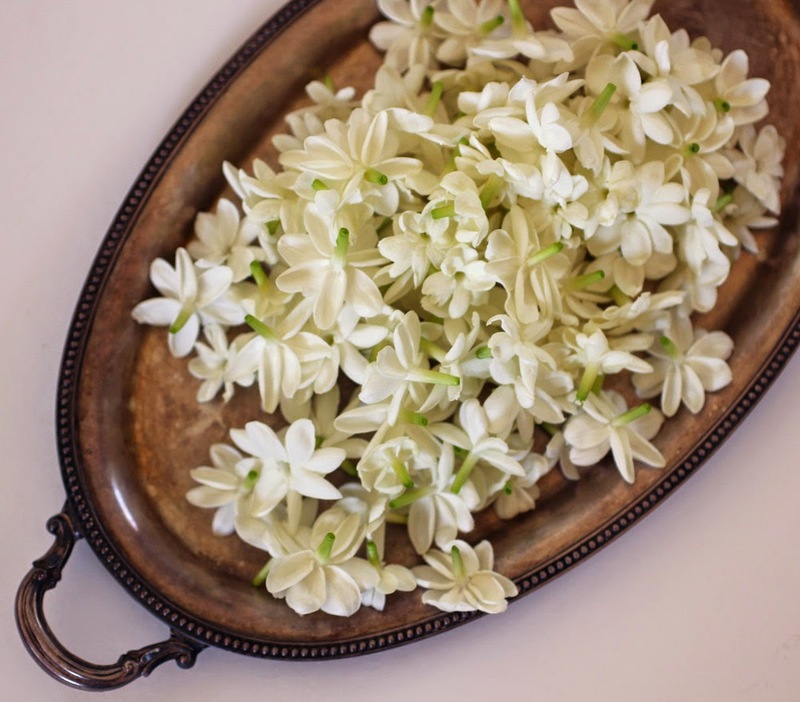 Like a well blended, complex botanical perfume, there was a journey of notes which ended with the most delectable tang of jasmine flowers...as if drinking an aspect of the soul of the plant which even the hydrosol cannot capture. While experiencing this exotic and completely new taste sensation I contemplated how the high proof alcohol extracts botanical components that water cannot, making this format of experiencing the flavor of these delicate flowers a completely new and different adventure. This tincture is meant for the 2015 edition of the Blossom Cologne. The 2014 edition of the fresh and uplifting cologne can be found here, keep in mind there is a specified amount of the cologne due to the finite availability of the hand infused alcohol contained within the fragrance. Each plant material tinctures up differently, some do not not release there precious aromatic treasures while others do so very eagerly. 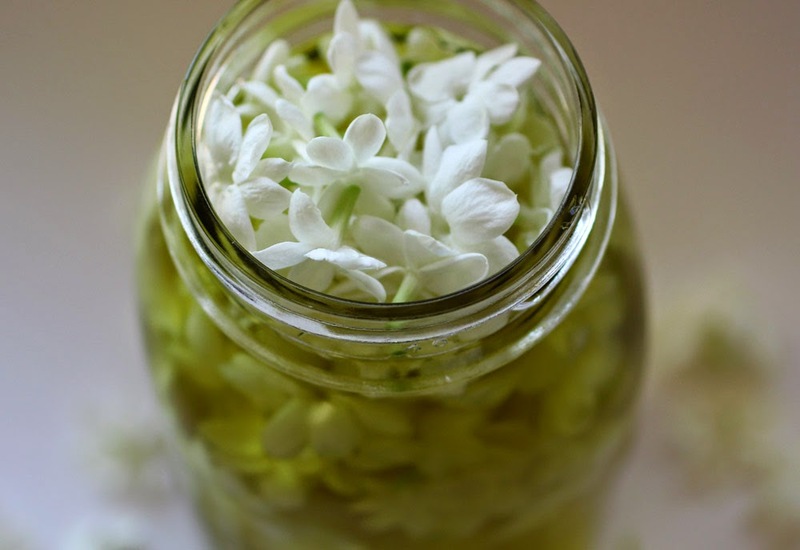 Jasmine sambac works well as long as you can keep up the task of filtering old blossoms and adding new ones consistently for a period of three months or so. The alcohol in the tincture I've been making is just about completely saturated with aromatics thus, tomorrow I will begin doing an enfleurage with the jasmine blossoms.